Full of Landy’s trademark wit, action and razor sharp dialogue, DEMON ROAD kicks off with a shocking opener and never lets up the pace in an epic road-trip across the supernatural landscape of America. Killer cars, vampires, undead serial killers: they’re all here. And the demons? Well, that’s where Amber comes in... Sixteen years old, smart and spirited, she’s just a normal American teenager until the lies are torn away and the demons reveal themselves. As soon as I learned that Derek Landy was bringing out a new book I knew I had to get my hands on a copy of it. I love Landy's Skulduggery Pleasant series (a series I still need to finish, actually) and Demon Road just sounded cool. I have to admit I was a little hesitant to go into this one at first. Landy had penned another urban fantasy book with another teenage girl lead and another older man for a companion. Was this just going to be Skulduggery Pleasant all over again? No, actually, it wasn't. And I was very pleasantly surprised. Unsurprisingly, this book made me laugh. I love the way Landy writes - particularly the way he writes his dialogue - and I thought the story was interesting, too. 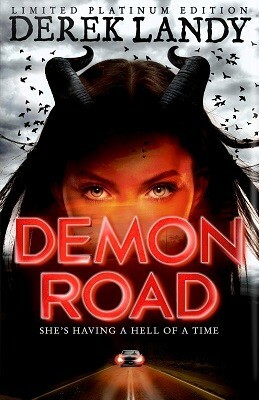 When I first learned Demon Road was going to be about a demon who was being hunted by her parents, I assumed it'd be about a girl who was adopted and her parents were actually demon hunters, or something along those lines, but it was totally different to what I expected and I loved that surprise. There's something truly horrifying about a story in which the two people you should be able to rely on more than anyone are the two people who are most likely to cause you harm. Speaking of harm, Landy isn't afraid to kill his characters. Of course I already knew that, but this book was certainly a reminder of his ruthlessness; his stories are deliciously gory, but they're never gratuitous which I really appreciate. It'd be very easy to go overboard with the violence, but Landy uses just the right amount to make the story creepy without making it border on the ridiculous. I liked how action-packed this book was - it's quite chunky for a YA book, but I sped through it - however, it started to become formulaic. Our characters would drive, stop in a new town and defeat some sort of supernatural creature, then get back in the car and drive to the next destination and so on. It wasn't boring, it was just samey. Thankfully the characters in Demon Road made it a lot of fun to read. I have a soft spot for Amber; I appreciated that Landy didn't write her as the kind of YA heroine who is completely new to a situation and yet manages to do everything right first time, and I liked that she makes mistakes. Sometimes she makes some really dumb mistakes, but she isn't a genius or a chosen one or a lost royal, she's an ordinary teenage girl who's thrust completely out of her comfort zone and she acts accordingly. I liked Milo, Amber's protector, a lot, too. He doesn't say much - I would have liked to have learned more about him, and I'm guessing we're going to in the second and third books - but he's the kind of character I like, with a very dry sense of humour and a very cool car. I really didn't like Glen, though, another character who ends up joining Amber and Milo on their journey. He was a useless, hopeless, irritating moron, and I really struggled to understand why he was there at all. I mean the guy basically ends up in the predicament Amber and Milo first find him in because he's stupid. I just hated him. On the plus side, he wasn't a love interest - there's no romance in this book at all which, for a YA book, was so refreshing. Ultimately Amber has more pressing matters, like the fact that her parents want to kill her. In fact rather than include a romance, Landy took the opportunity to address the fact that men shouldn't feel entitled to anything simply because they pay a woman a compliment. I loved that - good for him for writing about it! - however it did sometimes feel a little heavy-handed; I think Landy had the best intentions, and I'd rather him talk about it than not, but it sometimes felt like he was giving his female readership a 'subtle' little nudge nudge wink wink. Still, I'm pleased that message was there. So overall I enjoyed Demon Road, and I'll definitely be continuing with the series. The worst thing a person can do is try and compare this to Skulduggery Pleasant - I mean if you're going to do that, why not just reread Skulduggery Pleasant? - and if you can read the book without doing that I think you'll enjoy it. Is it perfect? No, but it's a lot of fun and I'm hoping it'll only continue to get better.